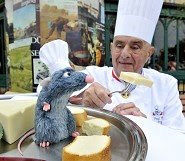 The star of the Disney Pixar film "Ratatouille" is now a regular patron of Epcot's Les Chefs de France restaurant. The Disney Imagineers have created their newest and smallest audioanimatronic figure to appear at Disney World. The Remy character is a 6 inch tall rat with soft fur, cute pink paws, and chef's hat (of course). Chef Remy is now making appearances at Les Chefs de France Monday through Saturday for 40 minute “Bon Appétit from Chef Remy” shows several times each day. Remy entertains the patrons through movements and lively banter. Along with his Maitre d' assistant he will make stops at each table in the restaurant so that everyone can interact with him. He may even start dancing if the mood and the music appeal to him. Remy follows in the large footsteps of the previous Living Characters. the first was Lucky the dinosaur that debuted in 2004. If the food alone wasn't enough reason to visit Les Chefs de France, this added entertainment certainly is a reason to head there now. Remy will be performing there now through September 5th, 2009. 1 comments to "Ratatouille Star "Remy" Now Appears Regularly At Epcot's Les Chefs de France"
My wife and I visited 2 parks the week of April 4-10, 2009 (animal and movie). The dining experience was not a highlight. One time they forgot part of the order and did not provide dressing w/a salad. When queried about the lack of dressing, the response was "it's on the salad." Well, it wasn't. The other time, the lines for pizza were so long and so slow moving, we gave up after 30 minutes. We also wondered about the organization -- those who obtained food had to walk out through the crowds (and if you wanted condiments, you had to find a way through the lines). Given the price of food, one would expect much better service.